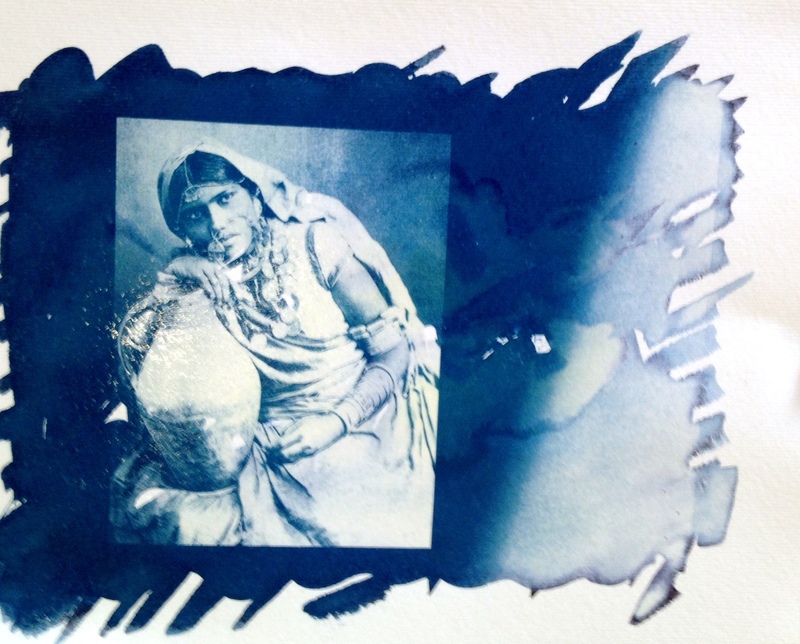 Cyanotypes – how blue can you get? 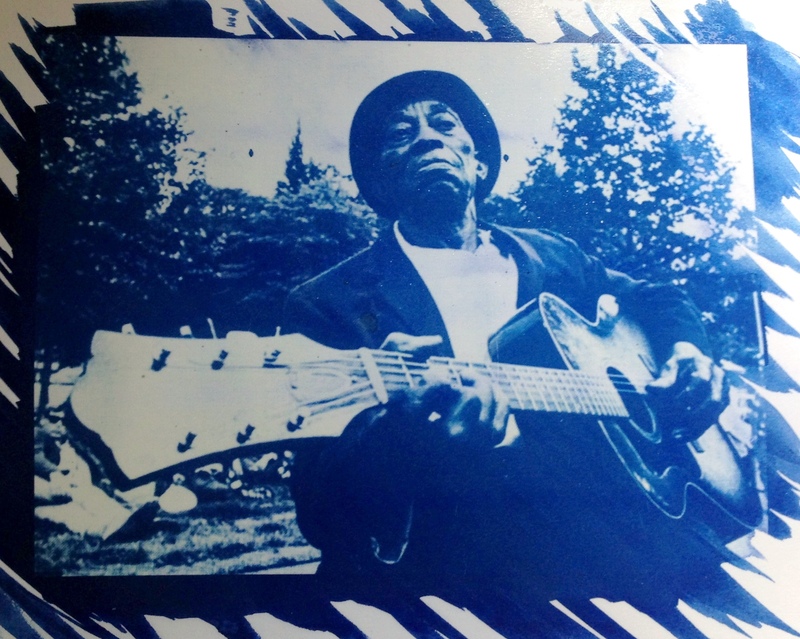 Looking at other posts on my blog you can see I like the Blues! 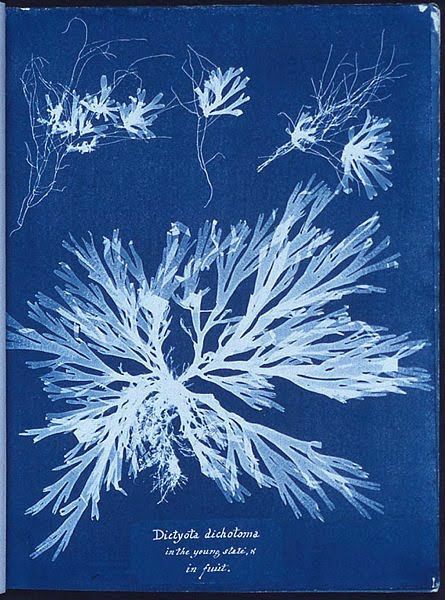 So working on cyanotypes allows me to extend my interpretation of blues 🙂 As it is her birthday this week, let’s remember Anna Atkins, who was born 216 years ago and produced the first book to include ‘photographs’ which were in fact,cyanotypes. 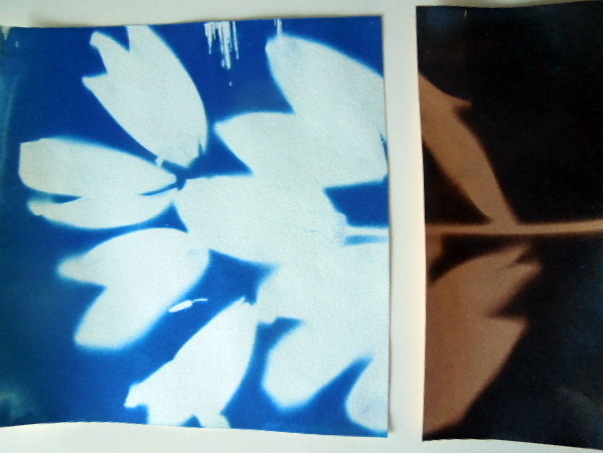 My first post on cyanotypes explored the range of possibilities for making and using cyanotypes; this post goes into more detail on making cyanotypes at home. 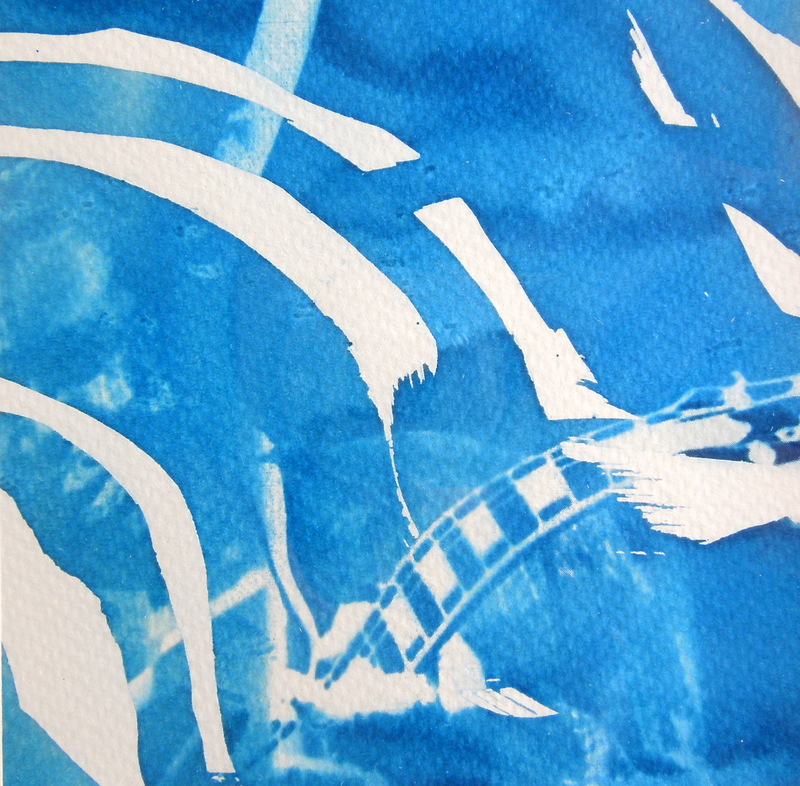 The process, in its simplest form, is to mix two chemicals to produce a ‘sensitizer’ solution which is then coated on to paper -such as watercolour or cartridge paper. 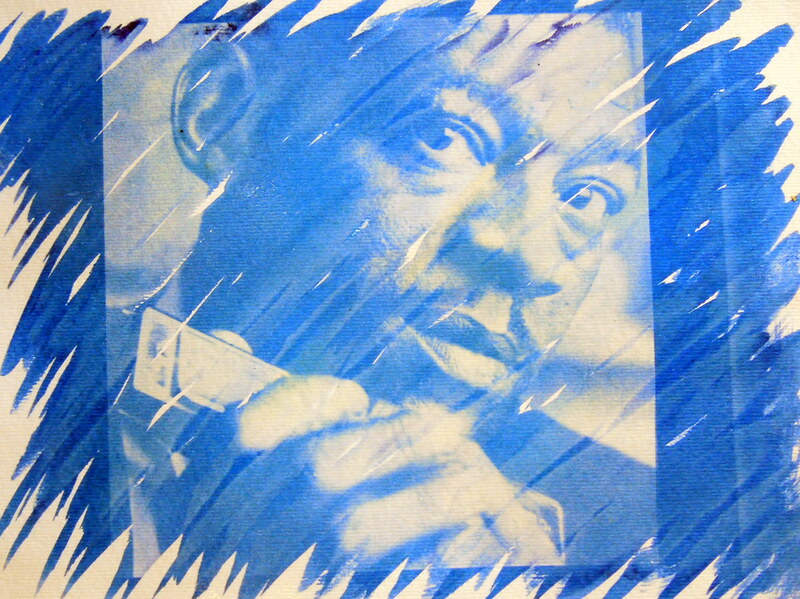 The image can be produced as a photogram -by putting objects onto the paper which will then mask parts of the paper and remain white while exposed areas will turn blue. 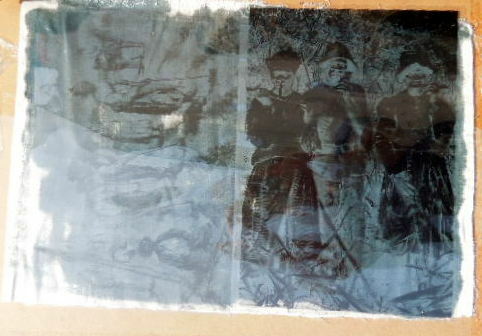 The alternative is to make a digital negative (same size as the image that you want e.g. A4. 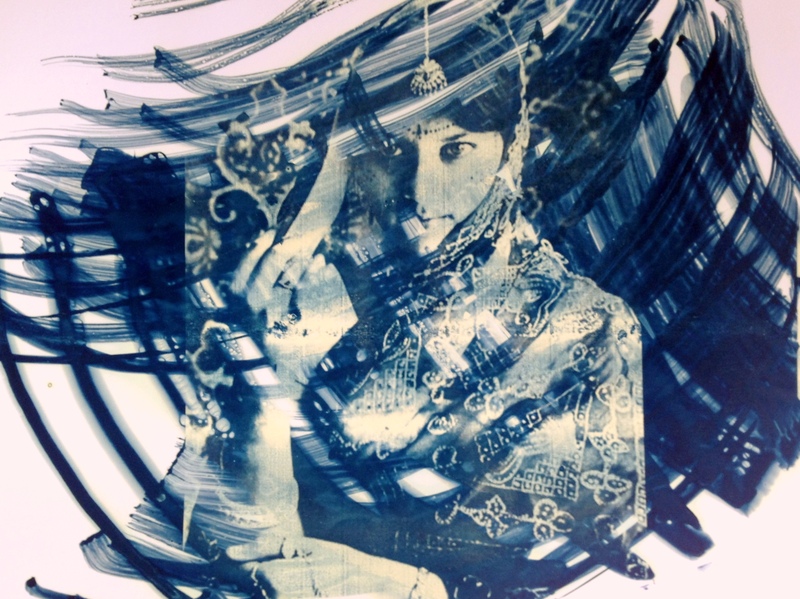 What you need: A ‘sensitiser’ – for cyanotypes this is composed of two chemicals which can easily be bought online and can be mixed at home. The two chemicals are Ammonium ferric citrate and Potassium ferricyanide ( also called Potassium hexacyanidoferrate(II) ). Each chemical is mixed in water (ideally filtered ). Using a plastic pipette to mix small quantities of ‘sensitizer’. 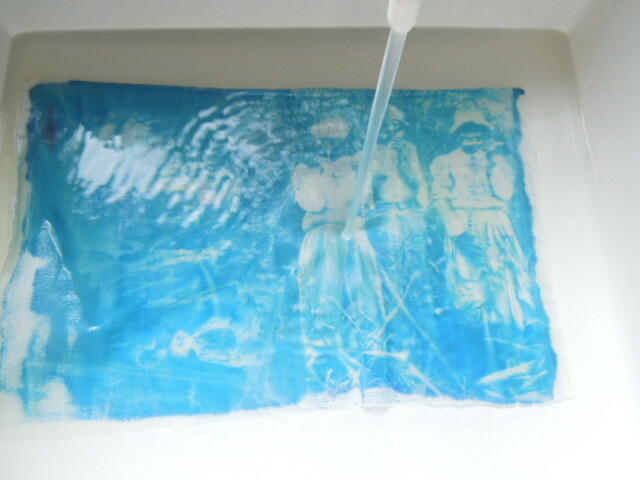 Once the sensitizer has been made (see below) paper, cloth and even wood can be coated to make it sensitive to UV light (the sun or other UV source such as UV tubes). What is helpful is that coating materials can be done under a household bulb (not a fluorescent tube) rather than a safe light. Dissolve the chemicals in water to make two separate solutions. Add Ammonium ferric citrate (25 grms) to 100 mls of water into one container and Potassium ferricyanide (10 grms) to 100 mls of water in another. 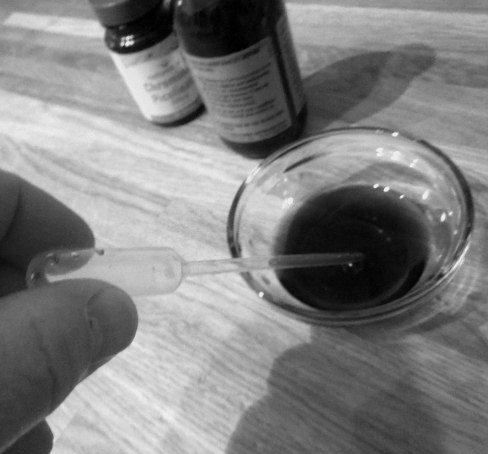 Stir with a plastic spoon until the chemicals dissolve. These two solutions when kept in brown bottles can last a few months. Of course , if you are unlikely to coat many sheets,then just halve the amounts noted above (which I normally do to keep the finished solution, i.e. the sensitiser, fresh.) Mix equal quantities of each solution together in a third container. Unused solutions can be stored separately in brown bottles away from light, but will not last very long once they have been mixed. Dispose of any unused chemicals in an environmentally friendly way. 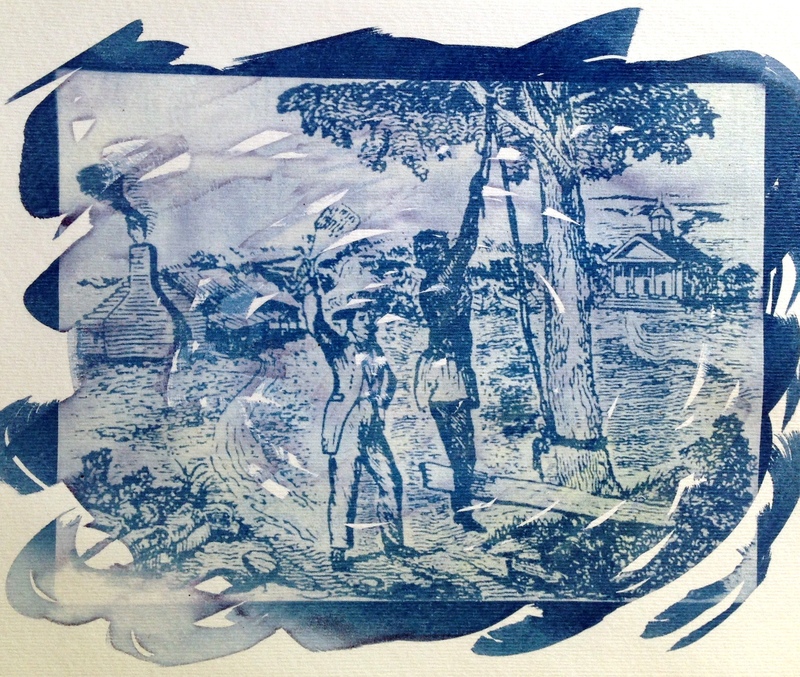 Once you have coated the paper or other material , let it dry for a few hours (although it is possible to use it straight away). To gain an image, the senistised material is left in the sun (or other UV source) for anything from a few minutes to half an hour depending on your position on the globe, the time of the year and the time of day. For example, in March at around 11.00 am at a latitude of 51 degrees N and 2 degrees W , exposure was between 8 and 12 minutes (see below). 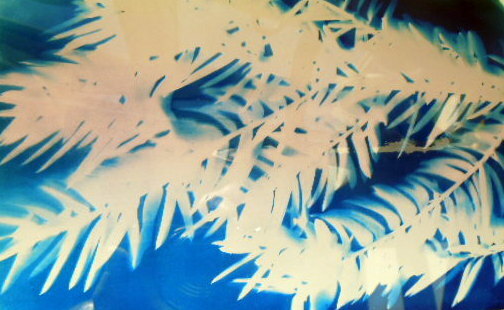 An image can also be formed using a digital negative. 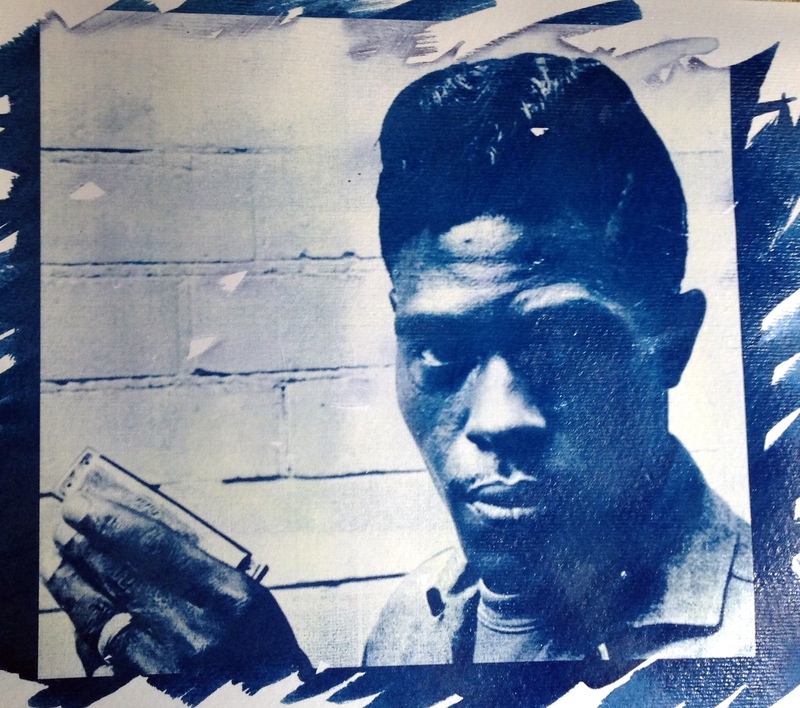 An image was found, adjusted in photoshop (can also use another program such as GIMP – www.gimp.org0.) 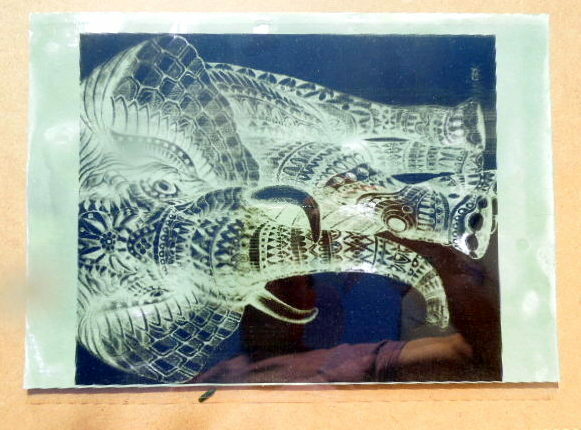 ; and then inverted to produce a negative ( invert once you have adjusted contrast etc) re-sized to fit an A4 sheet and printed on an acetate sheet ( overhead transparency sheet – £10 for 100 sheets approx.). 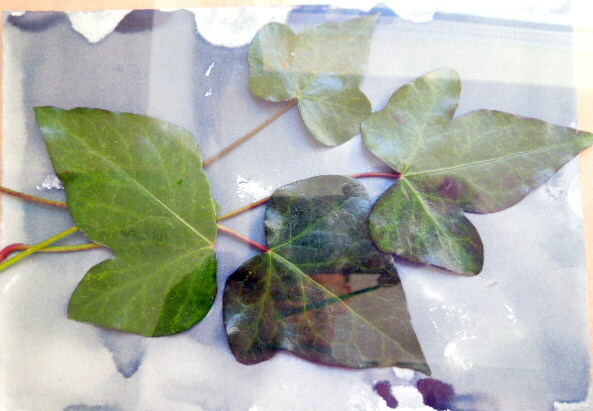 If a digital negative is not used then objects, such as leaves or shells, can be used to produce a photogram (as above with leaves). It is a good idea to make a ‘test strip’ to understand the levels of UV at that particular time. Cover 3/4 of the image on first exposure , then uncover 1/4 every 3 minutes or so. Then you can calculate the best exposure time (12 mins was too much so 9 mins was chosen). 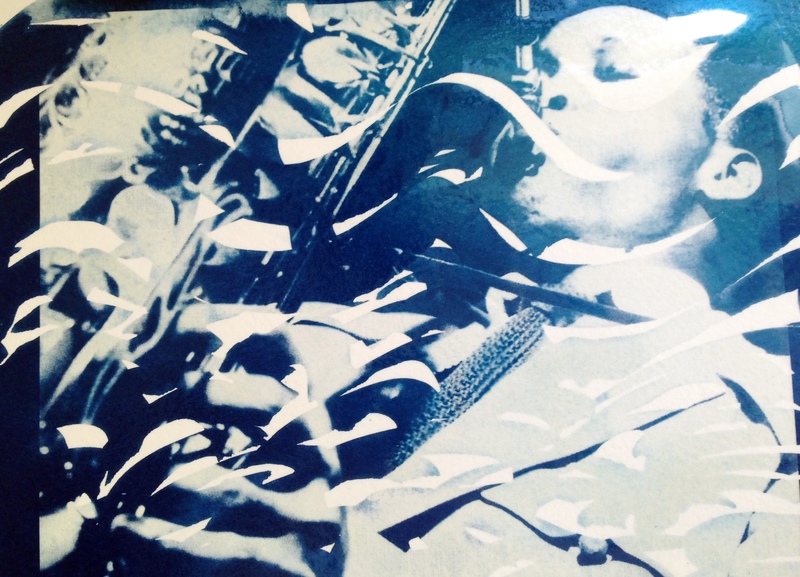 Exposed image with digital negative (A4) at top left. 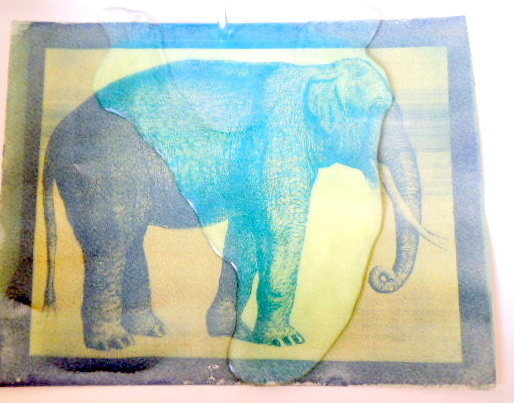 When the print has been exposed, process your print by rinsing it in cold water. The wash removes any unexposed chemicals. The water will run yellow at first. 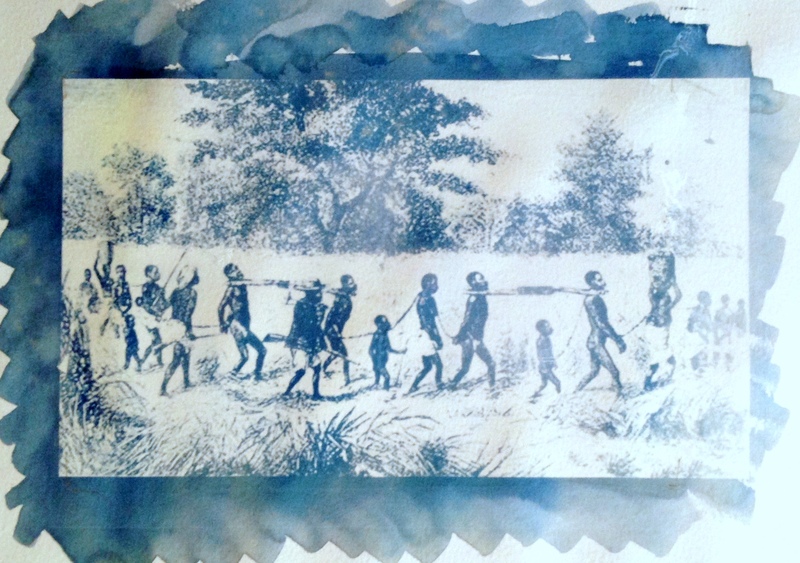 Washing prints – water runs yellow at first. Wash for at least 5 minutes, until all chemicals are removed and the water runs clear. 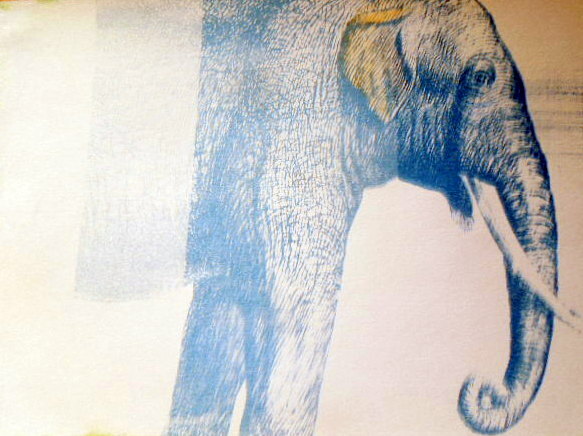 * Cotton cloth can be sensitised and processed in the same way as paper and is very effective. After about 10 minutes exposure to Spring sunshine, the cloth is washed. Notice the yellow colour washing out. 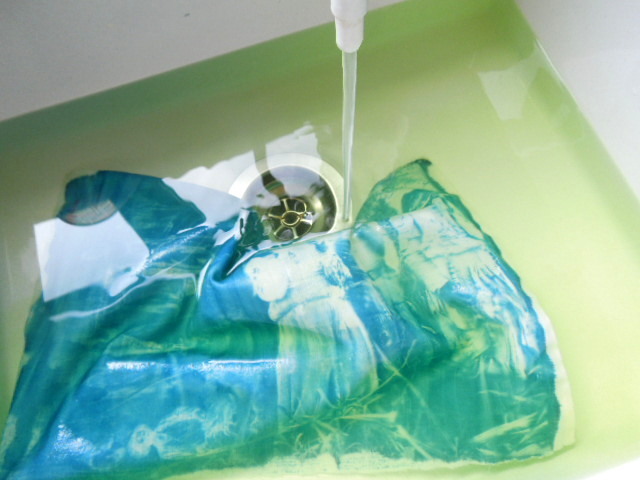 The water is becoming clear after 5 minutes of washing. 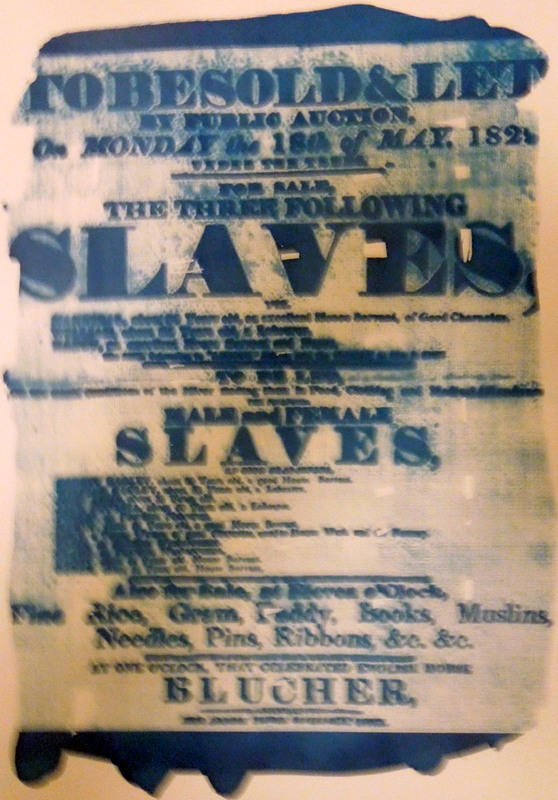 The blue colour is accentuated as it is oxidised. 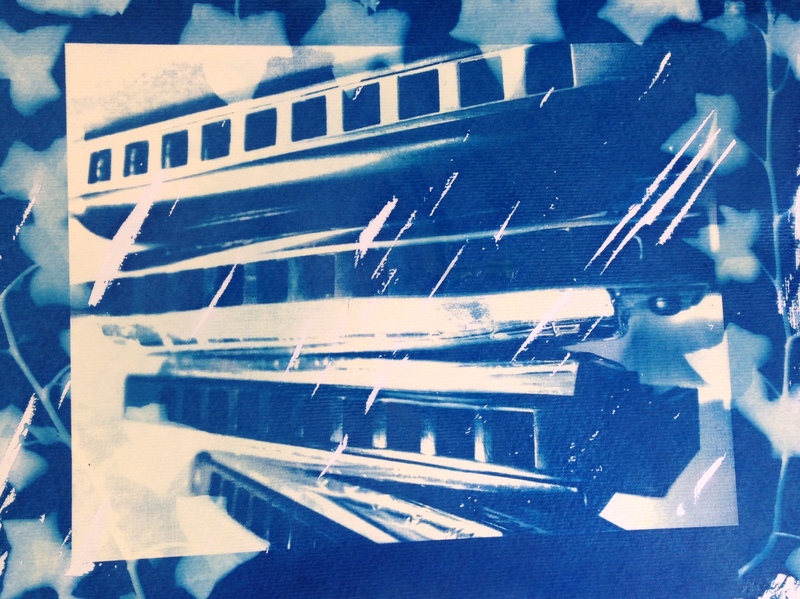 The final print/cloth can now be left somewhere to dry (lie flat or hung using pegs). Frame the result or make a cushion cover! 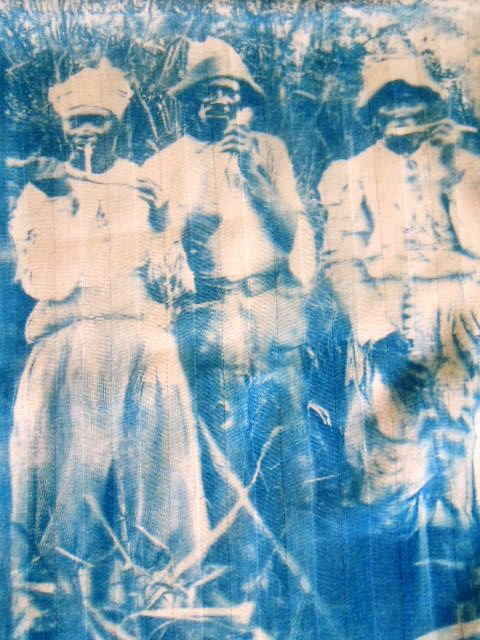 When you have explored the miriad of cyanotypes in all their subtle shades of blue, why not tone them brown? The process is another adventure in exploration. Some will say bleach first then tone, others say tone then bleach, others may say bleach, tone and then bleach again. Plenty to experiment with! The easiest and cheapest bleach is sodium carbonate (washing soda -not caustic soda!) – 1 teaspoon in a litre of water will do it. The cheapest toner is tea (black tea ,but can use green -just experiement) – put 5 or 6 teabags in warm water (if you are a tea lover -make your cups of tea and leave the part used bags in a jar for a day). 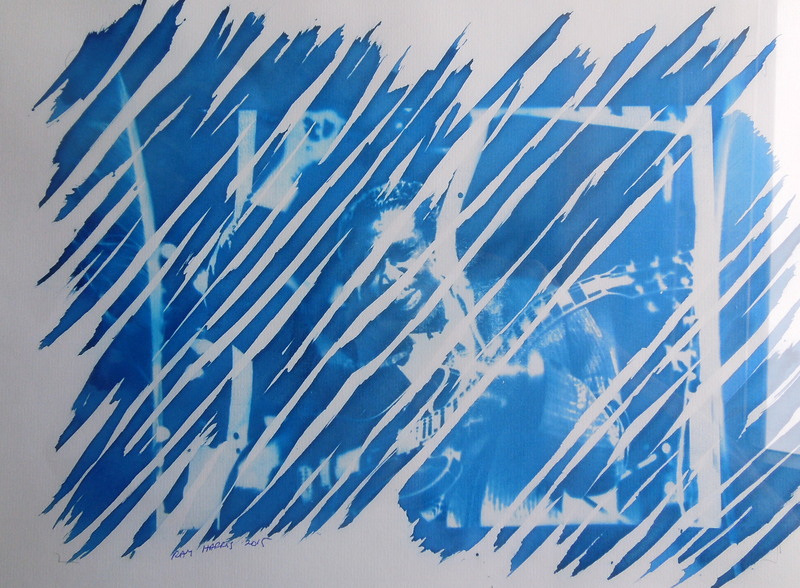 So, one method -bleach your cyanotype for 15-30 seconds. 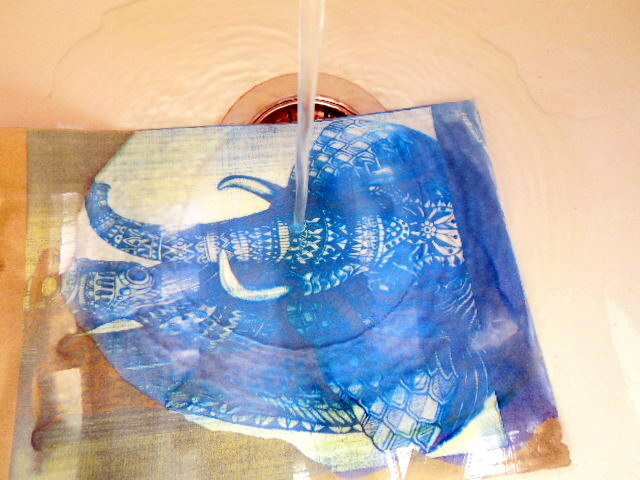 Now soak your print in the tea (should be dark brown) for about 15 minutes – can be more or less depending on the strength of your toner and the range of shades you want in your finished print. Dry and enjoy the toned print. 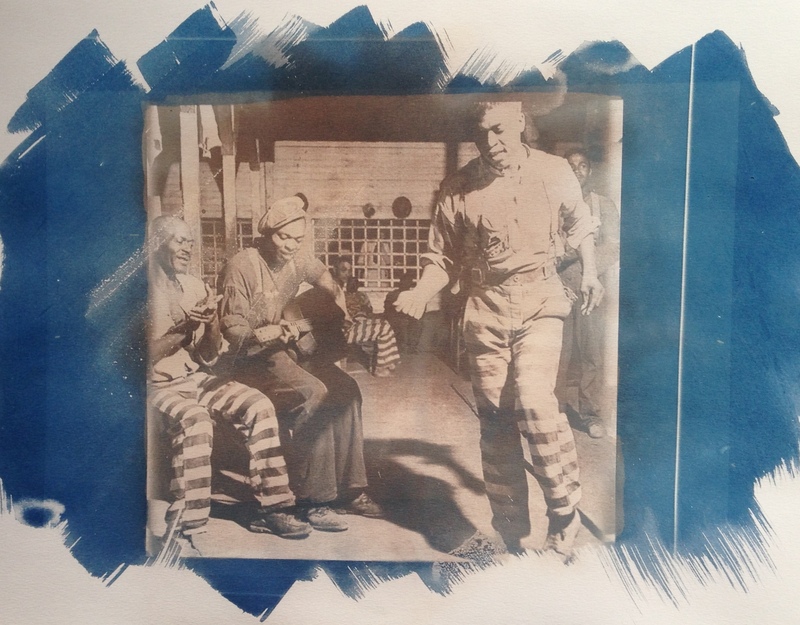 The tea toned example (on right) with its blue ‘original’ (on left) before bleaching and toning. 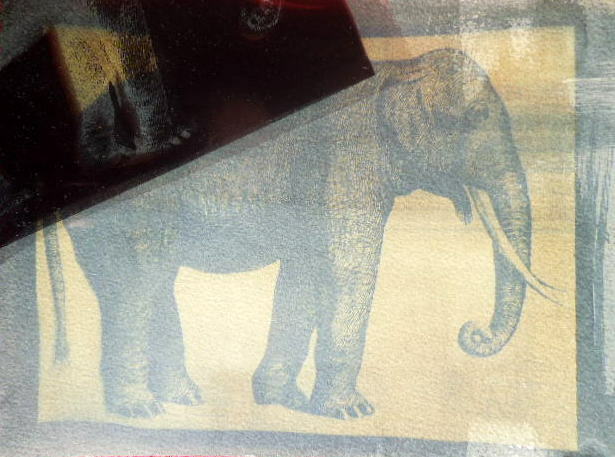 Subtler shades of brown can be achieved with less toning and weaker solutions. Keep a notebook handy so that while experimenting you can decide on the optimal conditions for the tones that you desire. More to come on this one. Any questions?